Perfect for your Bridesmaids! 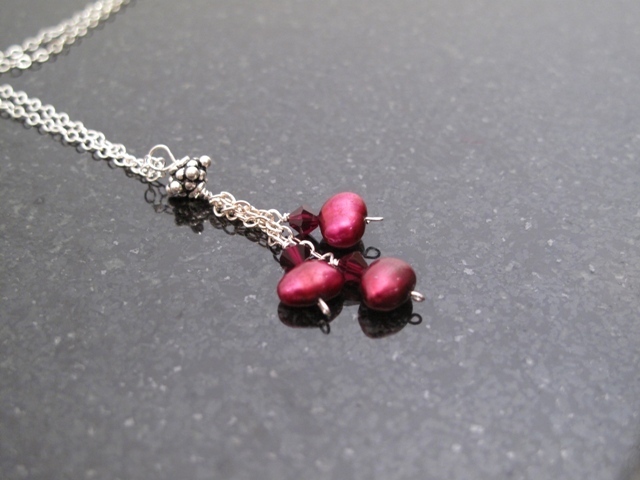 Beautiful red Freshwater Pearls raindrops on your neck! Each is hand-wrapped in Sterling Silver wire with dark red-colored Swarovski crystals hanging on SS chains. Sold on a 16" SS chain (please let me know if you would like 18" instead). 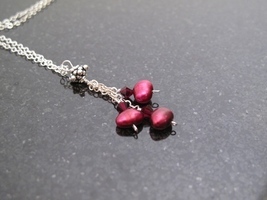 Pendant measures 1 1/2" L Pearls are an organic gem, created when an oyster covers a foreign object with beautiful layers of nacre. Freshwater pearls are cultured in freshwater mussels, mostly in China. Encourages open, honest, heart-to-heart communication. It enables one to accept love. Each pendant is hand-made and may differ slightly from the photograph. 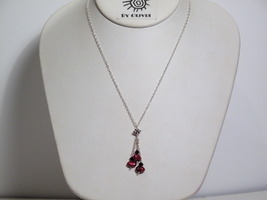 Contact me for custom order info - this necklace can be made in a number of different stones or in gold instead of silver. 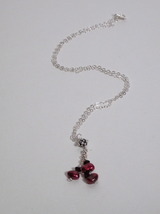 Check out my other 'raindrops' necklaces for other color ideas. I can make multiples (for each of your bridesmaids), and matching earrings are also available.